Spreads of TradersWay and FinProTrading by comparison. For now, I’m holding off posting a copy of the CCM reply in this thread, until I hear more from those of you who have been impacted by the CCM deposit fiasco. The CCM reply makes it clear that they want me to be convinced that they are doing everything possible to rectify a difficult situation, and to aid their clients in recovering lost deposits. I’ll certainly consider their position with an open mind. And they want me to convince you of these things, as well. This is where I have a problem. I’m not ready to certify anything regarding this matter, until I hear from you guys that this deposit problem has been resolved, and you are satisfied with the resolution. So, for now, I’m holding onto the CCM email, and waiting to hear from you. Sounds like an interesting (yet still suspicious) response that you received from CCM. I have heard nothing further from them since I copied / pasted their most recent email to this thread (post #4489). I’m curious as to how they think they are “aiding their clients in recovering lost deposits”, by asking us to re-deposit the money via bank wire…? Lol. That makes no sense. Bitfinex is fully exiting the USA. The cryptocurrency exchange said it will ill fully terminate its services for individual US customers by November 9. The first announcement on Bitfinex’s intentions in that regard was made in August and US customers are already barred from receiving financing from other users on Bitfinex’s peer-to-peer financing platform. By November 9 Bitfinex will shut down all functionalities for US clients, including trading, deposits and withdrawal. Additionally, US individual customers will no longer be able to provide financing on Bitfinex. This is the same cryptocurrency exchange that got hacked last year and the hackers made off with $72 million and then the CTFC fined the exchange with another $75,000 for the hack. sknight1. Did you finally get in touch with the person you were seeking out at your banking institution ? And if so what is the news ? Last I heard from Capital City Markets is they take everything on my account and it will be closed 27th of Oct 2017… With the exception that I must send more money to keep account open. I spoke with the woman at my bank this morning. She agrees that it sounds very suspicious, said that money transfers around the world can be completed in 2-3 days at most, recommended that I do not wire any more money to CCM, but (just like the CC company that someone else here used for their deposit) too much time has passed for them to be able to track / locate / return the money to my bank account. She also agreed that it sounds like a scam due to the broker possibly having financial problems of their own, that vetting & choosing a reputable payment processor is the brokers responsibility, that clients cannot be (re)charged for funds that are lost / stolen by the payment processor. So my bank is on my side. And she will email an official reply ASAP, which I will copy / paste here, as soon as I receive it. Bottom line is, CCM got my deposit & my profits. But they won’t be getting any more money from me. Nor will I continue to do business with them in any way. Sounds like they trying to buy more time, to take the money and run. This is bad, Didn’t anybody report this to their regulator? Capital City Markets claims to be regulated by the Vanuatu Financial Services Commission (VFSC), and we list it that way in our Offshore Broker List. However, I know nothing about the strength or competence of this regulator. Vanuatu is not exactly the U.S., the U.K., or the E.U. Most of the offshore brokers in our List are completely unregulated. Dealing with unregulated brokers is one of the prices we pay for going offshore to escape the CFTC. I still receive emails from Tallinex . I wonder if they have any input in this catastrophe of a broker that they bridged a lot of us to . Why don’t you ask Tallinex? Very bad news .There is something very deceitful /deceiving happening . Capital City Markets traders better be made aware. Everyway I tried to get to Tallinex , through email , through search , through other websites , it goes nowhere unable to contact them through their website. As you may or may not be aware, recent developments with our payment service provider has caused us to request clients to create charge back requests via their bank / credit union / card issuer for the initial card deposit amount. As a result in accordance to the below email, the withdrawal request cannot be processed. At first when I made the withdrawal request yesterday, my trading balance showed zero in MT4, so I thought MAYBE it would happen. But got this email and balance still reads zero - so truly gone at this point. Criminal! I had no problem connecting to Tallinex website a few weeks ago from in the US ! There is no doubt about it Capital City Markets should be criminally investigated ! No matter how supposed intelligently CCM tries to write up their fake reasons for stealing every ones money , something very suspect is going on . Wake up !!! I think we’re all very woke on this matter. Just reporting the latest info so everyone has information to work with. I’ve been around forex long enough to know that this is an all too probably occurance, so I’m never risking more than I can afford to lose. I wish we had decent domestic US options that offered some image of protection, but alas we’re over nannied on these matters. We are slowly giving up with the offshore brokers. Now have only TW few accounts. Stil testing Oanda and so far so good no issues yet. Also we thinking to start testing Forex.com. Those are the only options in US. If you are net worth over 1 million US, there is also Interactive Brokers. the leverage is only 1:50 and no hedging. But most of the people i follow for years that are profitable do not hedge and use leverage less that 1:50. I do find it interesting that when I google search Tallinex & click on the link to go to their home page, I am taken to page that looks this… attached below. This is a relatively recent change as I used to be able to at least “see” their homepage, even tho I wouldn’t be accepted as a US client. I suppose it’s possible that the US gvt is requiring brokers who don’t work with US residents to link this as their homepage for all US IP addresses. That pretty much shuts down any chance of a US resident even enquiring about an account. 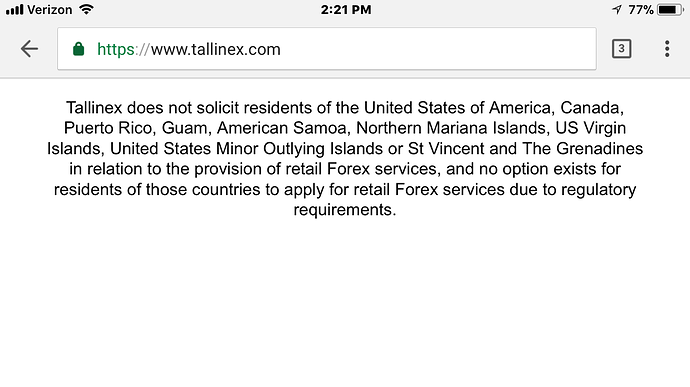 Tallinex is getting sued that is why I think they changed the website for US. I am wondering if they will show up to court. I believe it is in UTAH.